Paprika here! This important hugging day is actually celebrated January 21 (tomorrow). We prefer to get a head start because 1) Hugging is cool and 2) we have lots more time for hugging on a snowy weekend afternoon! National Hugging Day, as you can plainly see, is not limited to humans (though they are encouraged to participate!) 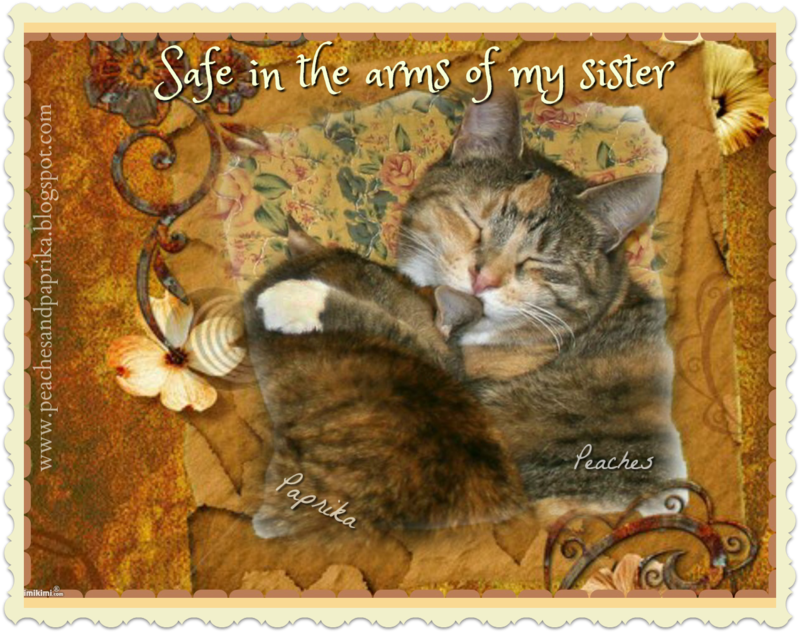 I love being hugged by Peaches because when she's in a good mood, I feel so safe & protected snuggled in her Paws! Among the benefits are boosting serotonin, lowering blood pressure, improving cardiac health and increasing relaxation among both participants. We can attest to that! We are joining Cat On My Head's Sunday Hop today & wish all of you warm hugs and more today & all week long! Happy Hugging Day, to you all! We don't have that here to my knowledge, but I'm happy to give it a go – if only I could find a mouse to share my hug . . . I am SOOO going to join in with this!!!! Your human might be more amenable to a hug than the elusive mouse! What a sweet hug! We forgot it's Hugging Day tomorrow. Can we hire your mom to be our secretary? That is a very sweet hug between you sisters. I love to see hugs. So adorable. Beautiful hugs - you two are so darling! we had no idea tomorrow was national hugging day! !